Like pretty much everyone in the whole world, my kids love pasta. Alas, I wish it was more nutritious – so whenever I can find some pasta that seems better, I give it a try. Barilla veggie pasta is made with zucchini and spinach pure and supposedly gives you a full serving of veggies. However, it doesn’t have any more fiber than regular pasta – perhaps because it’s not made with whole wheat. It does have some vitamin A, though I think it may be better to get this by adding some shredded carrots to the pasta sauce you’re using (something which I just thought of, so never tried – but will now). Still, substituting this pasta for regular pasta is a painless way to get a bit more nutrition. There are some minuses, however. Now that Barilla has abandoned its anti-gay practices, the main one is the price. It can cost about twice as much as bargain regular spaghetti brands, and it costs 25% more than the regular Barilla pasta. However, it’s still far cheaper than other enhanced pasta brands. It’s sold in a 12 oz package, which is perfect for a four-person family, but may be too little for larger families. In all, I’ll probably buy it, particularly when it’s on sale, though I’d like to try the more nutritious brands as well. Last week my 16-yo daughter actually got a craving for Ethiopian food. We don’t eat Ethiopian food very frequently – maybe once or twice a year now -, so it was a surprising craving in her part. And as she said, how privileged is she that she gets to have a craving for Ethiopian food and have it satisfied. We decided on Ethiopia Restaurant in Berkeley because they have a great Groupon deal: two appetizers, four entrees, two desserts and four glasses of wine for just $40. You need to add tax and tip, but I can’t imagine anywhere else you can get a deal anywhere as good as this (if you know of one, let me know!). We had been to Ethiopia Restaurant before, and this time it didn’t disappoint either: the food was just delicious. We started with the sambousas, the Arab/African version of Indian samosas: triangles of phillo-dough style pastry, filled with either lentils or meat, fried and served with a red sauce. They were pretty good. My 16-yo ordered the nene’wee, a sampler of 5 vegetarian dishes you pick from 12 choices. She absolutely loved the yekik alicha, a yellow split pea dish that they also serve as a side for other dishes. Next time, she may just order this. She was happy enough with the kinche (bulgur), but the other three dishes she chose were too spicy for her. The engudai we’t, a mushroom “stew” (actually mushrooms cooked in a butter or oil based sauce), tasted very much like t’ibs wet, its beef version. The sauce was exactly the same. The yemisier we’t (red lentils) and shiro we’t (garbazo beans) seemed to have different sauces, but they were equally spicy. The meat-eaters among us ordered the yebeg alicha (lamb “stew”), yebeg t’ibs (sauteed lamb) and the meat combo which comes with doro we’t (chicken “stew”), t’ibs wet and yebeg alicha. They brought the first two dishes in a huge tray, on top of injera, but they forgot to add the third – so the tray looked very empty. It wasn’t until we were finished with the food that we were able to reach out to call the waitress and have her bring the meat combination (we were still hungry, so we needed it). I got the distinct impression that you get more food by ordering your meal individually rather than family style, so next time we’ll do that. All of us really liked the yebeg dishes, though one of us had to be told it was beef for her to try it (here is hoping she doesn’t read this review). We particularly liked the sauteed lamb dish. The t’ibs and doro wet dishes were both spicy, though my husband enjoyed them. The rest of us are wimps. Whether individual or family style, dishes are served with the split pea stew outlined above and a simple salad of lettuce, tomatoes and onions. We ordered a bowl of rice which my daughter didn’t like (my husband tasted it and said it had butter in it), but which they didn’t charge us for. The injera is made with teff and was cold, but otherwise good. For dessert, one of my daughters had the baklava, which was a pretty small piece, and the other the chocolate mousse pie. They both seemed happy. I had a glass of the chardonay, which was sweet but good. My daughter had a sparkling apple cider – they didn’t charge us for that either, but we declined the 3 other glasses of wine. Service was good and friendly, but the two waitresses were overwhelmed with the full dining room – that’s why it was very difficult to get their attention during the meal. Groupon says you can buy a voucher for this deal every 30 days, so I’m planning to go again next month. 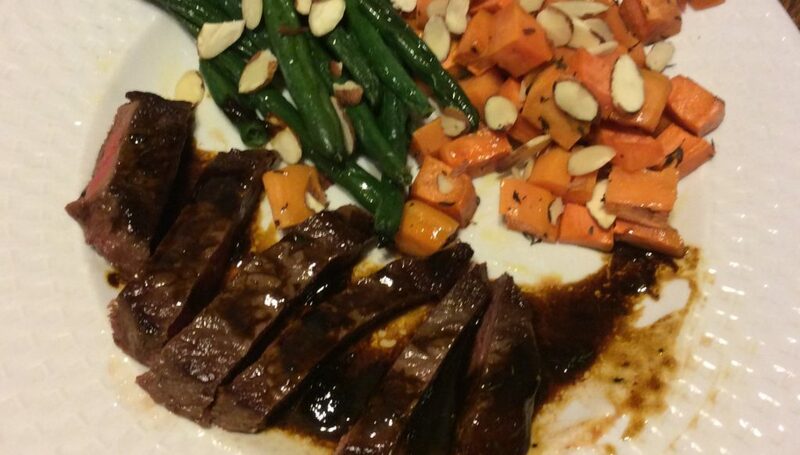 A sauce or a topping can either enhance or ruin a steak. 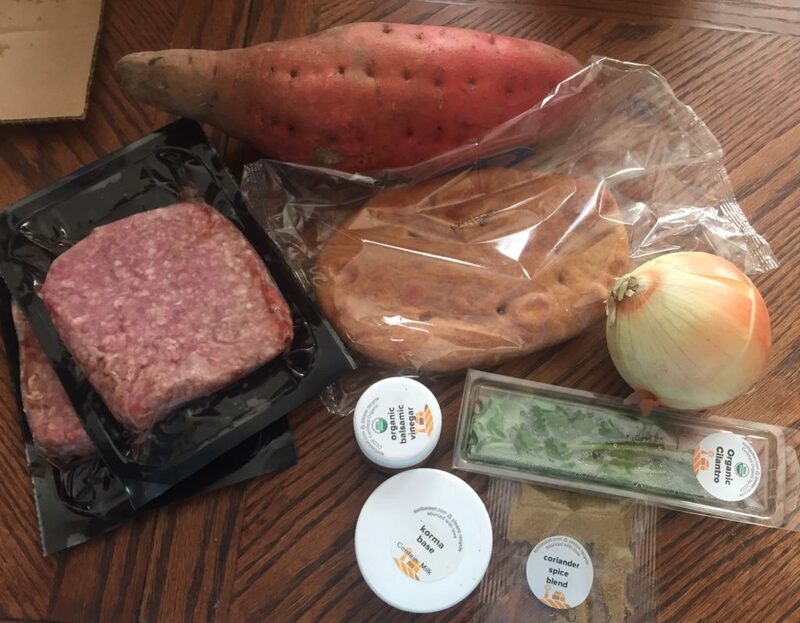 Last week, I made a HelloFresh kit that had steak with an amazing thyme-demi-glace sauce that greatly improved the meat. 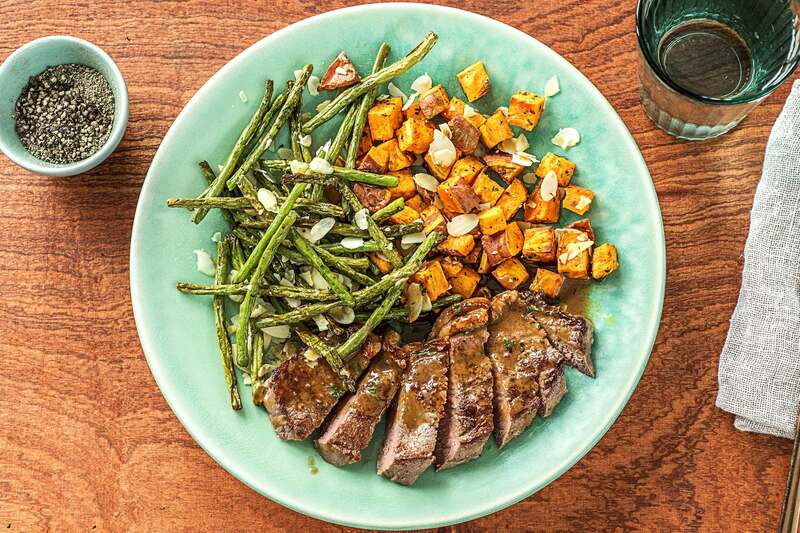 The relish in this kit for steak and roasted sweet potato with scallion-ginger relish did the opposite, it hid the flavor of the meat and just made it taste vinegary. There were other problems as well. 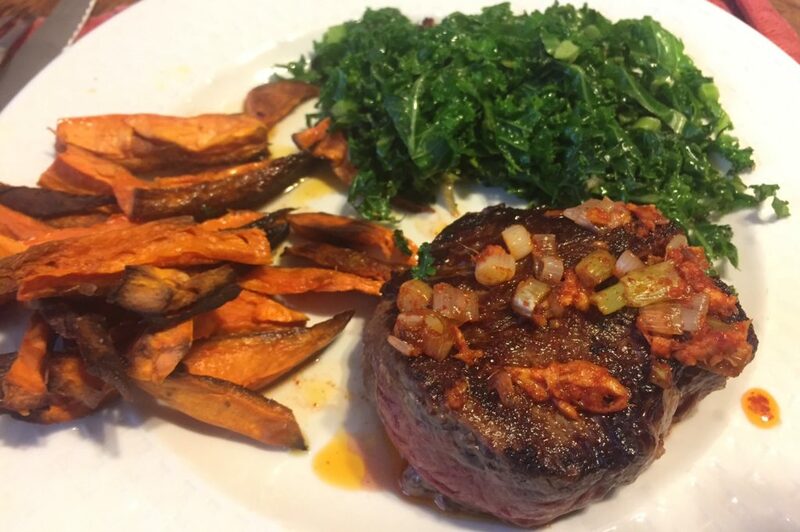 The oven-baked sweet potato fries (which I overcooked) were pretty boring – again, I preferred the HelloFresh version which adds thyme. This was my first time eating kale and I found it surprisingly edible. It stayed crisp even after cooking for a couple of minutes and I liked the subtle garlic flavor. Not a bad way of eating your veggies. Sun Basket advertises that you may get organic filet mignon, organic rib eye or top sirloin in this kit. Of course, I got the cheaper top sirloin – which weren’t even organic, sort of defeating the whole point of this subscription. While the steaks were pretty small, ~5 oz each, the whole meal was the right size portion for dinner. Still, I was not happy that one steak was far thinner than the other. In this case it wasn’t too big a deal, as my daughter likes her beef well done and I like it medium rare, but it would have been a pain if I was cooking for two people who like their meat with the same doneness. All the ingredients in the meat were fresh and remained so even a couple of days after I got it. 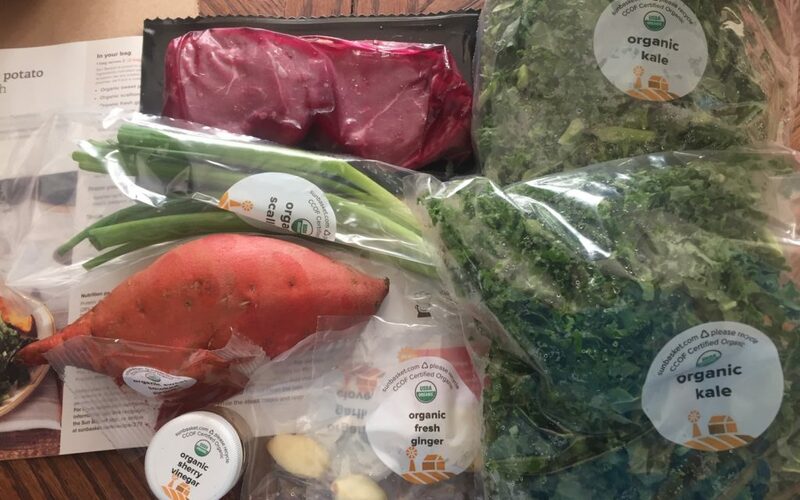 The produce was organic even if the beef was not. It was relatively easy and quick to put this meal together. But then again, it would have been relatively easy and quick to shop for it as well, specially given that the relish was totally unnecessary. This is one meal for which you don’t need to have a kit. I paid $11 for this kit using a discount, and it was definitely fine for that, but it would be overpriced at $24. 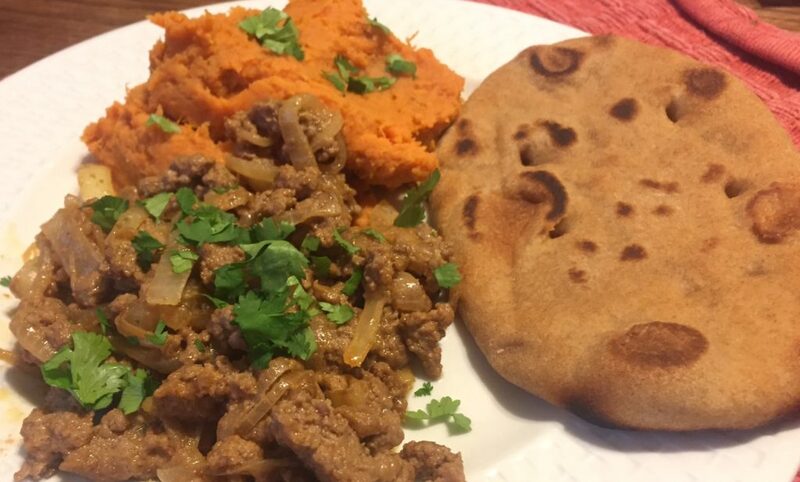 I love lamb korma so when I saw this lamb korma with sweet potato mash and toasted naan kit on Sun Basket‘s menu, I knew I had to get it – even if I was a little suspicious of a meal kit being able to really being able to turn out one of my favorite dishes. My suspicious were justified. While this kit produced a very nicely spiced ground lamb, it didn’t taste like any korma I’ve ever had at an Indian restaurant – in the US, England or India itself. Still, the “korma” sauce Sun Basket provided – and which is fully absorbed by the meat when you cook it -, enhanced the flavor of the lamb and made it very tasty. The whole wheat naan bread was also much better than it had any right to be – though I wish there had been some sauce for it to soak in. And adding balsamic vinegar to the mashed sweet potatoes was a glorious idea. It transformed baby food into something quite tasty. However, for whatever reason, I felt a little bit nauseous later that night and that nausea returns whenever I think of this kit. My husband didn’t report a similar feeling, so it may just be me. It took me about an hour to make this meal, but I’m a slow prepper/cooker. Probably the worst part about the meal, though, was the presentation. While the produce in this kit was organic, the lamb was not, though I’m not sure that’s particularly important vis a vis lamb. Everything seemed to be fresh. 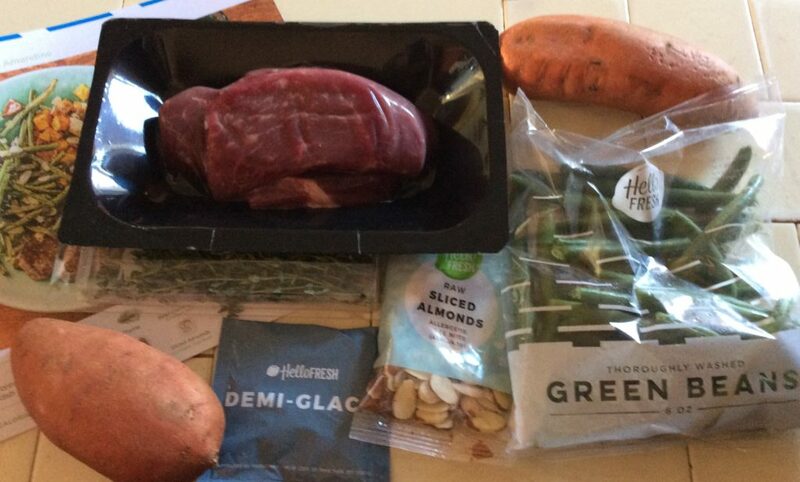 All in all this was a good meal kit. I paid a discounted price of $11 for the kit (which serves two), and it was definitely worth that, but I don’t think it was worth the $24 regular price. For that amount of money I can get a large-enough-for-two order of real Indian lamb korma at my regular take-out Indian restaurant, in addition to rice and some pakoras or samosas – and I wouldn’t have to cook it myself.